Christmas decorations in stores before Halloween can only mean the holiday season is officially kicking off! For some, this incites feelings of excited anticipation (Decorations! Fires in the fireplace! Holiday parties!). For others, it’s a looming presence on the horizon filled with stress, planning and, oh, the shopping. If you’re anything like me, the holiday season is a time to tighten your belt and rearrange your budget to allow for the festivities ahead. Thanksgiving dishes, party treats and those Secret Santa gifts can really add up! If you want to revel in this season without over exerting your wallet, here’s some tips for enjoying – not just surviving – the holidays without breaking the bank. With sites like Pinterest and the plethora of online tutorials available, today it’s easier than ever to hand make decorations, party favors and gifts.This holiday season, instead of buying gifts for everyone on your list, choose a couple people to make gifts for. Always wanted to learn to knit or crochet? Make scarves and beanies! Get the kids involved and turn a project into a fun crafting time. Let them choose a couple gifts to make for family members or friends. Handmade gifts can be personal and thoughtful and are always appreciated. Second hand stores are great places to find holiday decorations for your home or serving pieces for parties. I’ve often found new or gently used items that are great for center pieces. Especially when it comes to Christmas ornaments! They’re also a perfect place to find holiday clothes for the kids. Oftentimes, a Christmas dress is only worn a couple times before it’s outgrown, so you can usually find them almost new. It’s easy to put off your gift buying, “I’ll let future me worry about that in December.” But, you don’t have to wait until Black Friday and fight the stampede to get your shopping done. Take advantage of sales when you see them. Have your eye on a specific item? Start looking around online. Many sites now have features that will alert you when items go on sale. There are even phone apps that will show you competing prices. Coupons are also a great way to get more bang for your buck during the holiday shopping season. If the thought of spending money on something for you and your kids to wear to upcoming holiday events makes you crazy, stores like Kohl’s offer coupons that soften the spending blow so you can celebrate in style without feeling guilty. If you’re looking around your house thinking you’ll have to clean out some of the clutter to make room for the gifts you’ll be receiving this season, dreading the impact that shopping will have on your finances, or can’t think of anything you “want”, consider talking to your friends and family about cutting back on gift exchanging. Instead of buying for everyone, do a Secret Santa in which everyone only buys for one other person. Or, talk to everyone and see if you can agree on setting a spending limit for gifts. In my immediate family, we limit it to one gift per person. While this formality might sound like a fun-sucker, it actually makes for a much more enjoyable gift giving experience. It makes shopping less stressful, and the single gift more meaningful. The holidays provide so many great opportunities to give. They’re also a wonderful time to teach our kids about giving and helping others. If you want to contribute, but are tight on cash, consider donating your time. With such an influx this time of year, many charitable organizations need help gathering and distributing meals, organizing and even wrapping gifts. Look up food banks or charities in your area and find out how you can help. Some will allow you to bring your children to help too, if they’re old enough, which is a rewarding and enriching activity you can do together. The holidays are meant to be enjoyed. While it can be a strain on our time, our energy and our finances, we should make sure we still appreciate the opportunities it brings for creating memories with the people we love. This year, no matter our circumstances, let’s slow down and take in the splendor of the season. 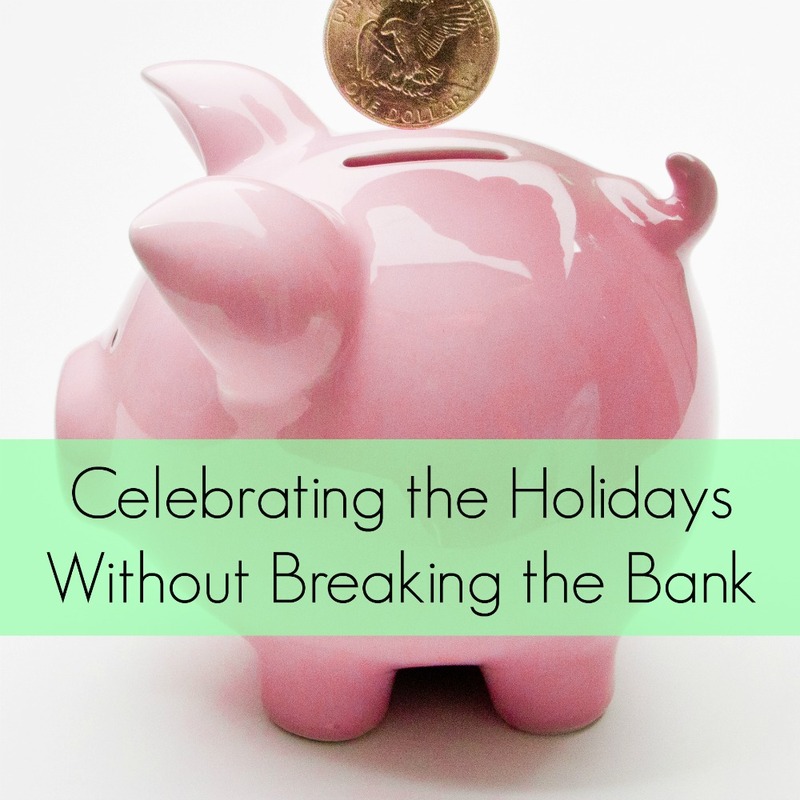 What are some ways that you celebrate without breaking the bank?